The Foyer of the new Linbury Theatre at the Royal Opera House. The Linbury Theatre Foyer was created as part of a larger refurbishment scheme to provide more open and welcoming front of house spaces and a new Linbury Theatre. The Foyer is open to the Main Entrance and is visible from passers by on Bow Street. 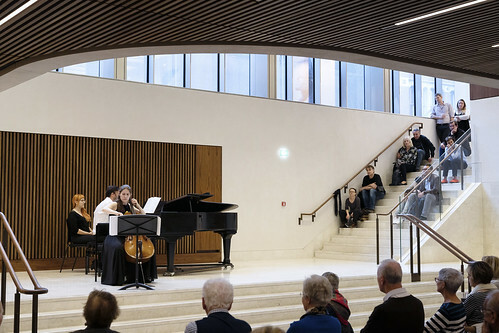 A variety of events are held in the Linbury Foyer, including free lunchtime performances, Crafternoons, and talks with authors, academics and artists. 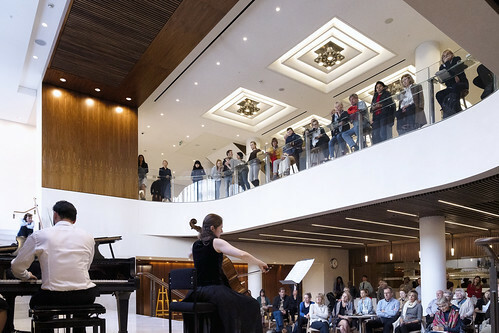 Drop by for free lunchtime performances, featuring Royal Opera House artists and guest artists. Learn and dance steps inspired by ballets performed at the Royal Opera House. All ages and abilities are welcome to join in and sing in an opera chorus.